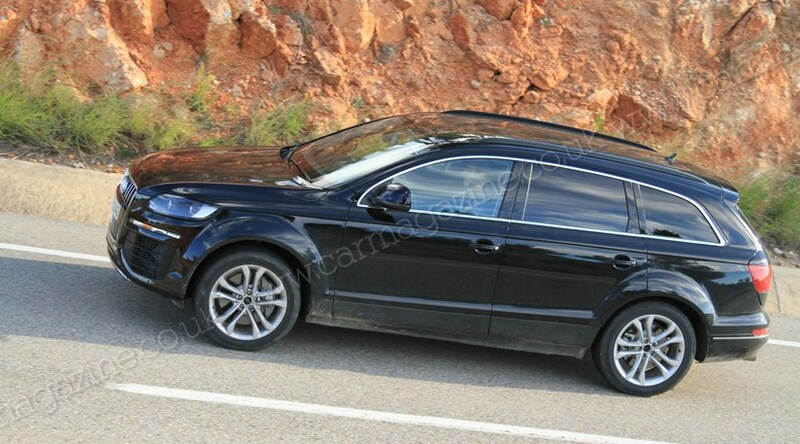 Home Spy Shots Audi Audi Q7 (2014) could monster SUV use carbonfibre? Audi Q7 (2014) could monster SUV use carbonfibre? You’d be forgiven for thinking this was just your standard, run of the mill Audi Q7. However, these shots – captured by our spies in the hills – show that of the long awaited updated edition. With the imminent arrival of the new Range Rover Sport, Audi's reacted and upped development on its flagship SUV. So, what hardware is this Audi Q7 testing? Wearing almost no disguise at all, it seems little has changed for the Q7 but don't be fooled – this isn't another spot-the-difference facelift. This is merely a test mule hiding new Q7 running gear beneath the skin of the current model. Look closely at the shots and you’ll see the right air intake has been sealed off and the left one opened up, indicating Audi are fiddling with the Q7’s cooling. Looking at the rear and instead of finding some neat chrome-tipped tailpipes, you’ll find it sporting two rather unattractive pipes proud of the rear bumper. It's a tell-tale clue new engines are being put through CO2 emissions testing. A closer look at those arches and you’ll notice those wheels look a tad overwhelmed by the bulky body. A wider track is expected to be fitted to a stretched version of the MLB platform that will also underpin the next Porsche Cayenne and Volkswagen Touareg. Can we expect any other headline changes for then Audi Q7? The new Q7 is to shed a whopping 350kg from its original weight of 2300kg. It’s still no featherweight, but that’s the equivalent of kicking out a full car of passengers. Wondering how Audi managed such a ruthless diet? You can thank Audi’s new multi-material body technology. The next-gen Q7 will be fashioned from more exotic materials, Audi R&D boss Wolfgang Dürheimer revealed to CAR: 'It's hard to believe, but it's true: we can weld aluminium onto steel, we are able to glue carbon fibre onto aluminium, and we are able to use steel together with carbon fibre'. Will Audi's use carbon structurally, rather than just as fancy trim? Yes, carbonfibre is expected to be used in the body, as Audi's production team finds a way to efficiently and quickly (and thus cheaply) build these lightweight 'multi-material'. Ingolstadt often preaches 'advancement through technology' (Vorsprung durch Technik): this is a big chance to show off just what its engineers can do. There’s also the question of price. With the introduction of carbonfibre prices will be expected to rise. On the flipside, the reduction in weight and resulting improvement in running costs could be enough to tempt punters away from desirable alternatives, like the aluminium-underpinned Range Rover. For CAR's previous coverage of the next-gen Q7, including engine specs, please click here. Exclusive shots of the new Q7 Bulging wheel arches indictae a wider track Sealed off right air intake, cooling testing Grubby exhausts indictae CO2 emissions testing Blimey it's big but bigger engines?